Whenever you groom your horses tail you pull out lots of hair or break the hair halfway down the tail. Which is why most horses tails are thicker halfway down the length than at the bottom. Every tail hair that is pulled out will take around two years to re-grow and broken hairs will take a very long time to reach full length. Grooming a horses tail is only cosmetic, unlike full body grooming, which has health benefits and conditions the coat and skin. So, there is no real need to brush the tail every time you groom, apart from the bone (dock) at the top of the tail. The more you brush the thinner the bottom of your horses tail will become. 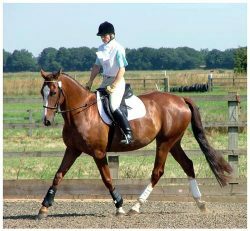 Your horses tail will need washing occasionally and it is after washing that you should brush it. Use a good quality baby shampoo to wash it thoroughly. Baby shampoo is good for horses with sensitive skin. Rinse all the soap out and dry as well as possible, but do not rub too briskly as this can break hair too. Most experienced riders will grab the tail hair just below the dock and spin it through the air to dry it. Once dry rub in a good coat conditioner or mane and tail detangler; then with a good quality human hairbrush, very gently brush out one tangle at a time. Do this slowly starting from the very bottom and working your way up the tail. If you start at the top you will be trying to brush out several tangles at once instead of one or two. Make sure you have organised plenty of time to groom your horse’s and try to use it as a time for bonding with your horse as well as improving how your horse looks. In the winter it is best to keep your horses tail trimmed nice and short. Try plaiting it just below the dock to the bottom like a childs hair as this will help keep it clean and tangle free. 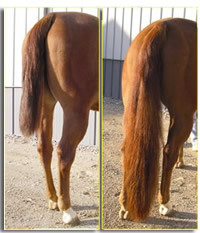 Then in the spring, just in time for the showing season, you will have a nice thick, luxurious tail. A picture paints a thousand words, as they say, and this video presentation will demonstrate how to plait a horses’ tail better than any words could. Plaiting a horses’ tail helps to show off the buttock, the line of the hindquarters and emphasise the movement of the rear legs. Are You & Your Horse In A Rut? © 2005 - 2018 Local Riding - All rights reserved.